Written by Pua Xiner and Lim Weijie. With a background in architecture from NUS, Xiner applies a holistic design and welfare framework to designing and managing courses at Skillseed. When not sculpting new courses, sustaining the well-being of participants and the Skillseed family or working to make our website more user-friendly, Xiner can be found using her hands to capture the world around her with her camera or sketchbook. As the head of Research and Development at Skillseed, Weijie is constantly seeking ways to best pursue our social mission of doing good better. Currently a Psych major at NUS, he keeps busy on weekends (and on weekdays after 5:30) hunting down the best combination of ice cream and waffles in Singapore, and capturing people, places and moments on his camera. A SECONDARY SCHOOL organising an Entrepreneurship Conference - that must be a first! We were incredibly excited to be attending our first ever entrepreneurship conference on 26 May 2015 as members of Skillseed, and one where our boss, Ms. Phua Huijia was invited to give the keynote speech. 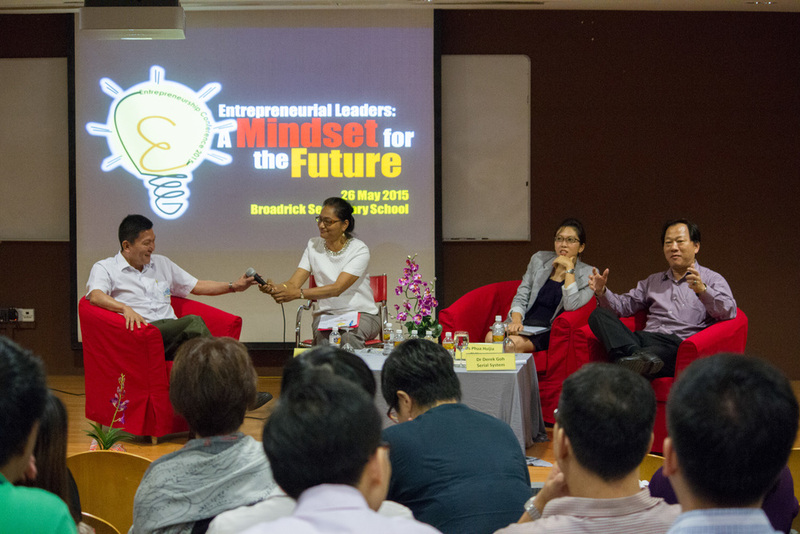 Too often, we think of entrepreneurs as grown-ups with tons of experience, but our experience at Broadrick Secondary’s inaugural entrepreneurship conference on Entrepreneurial Leaders proved otherwise. It was heartening for us to see young budding entrepreneurs who were still in secondary school showcasing their business ideas, proving that age is just a number when it comes to making one’s entrepreneurial dreams come true. Mr Kenny Yap, Ms Phua Huijia, and Mr Derrick Goh, in a panel dialogue with educators from various secondary and primary schools. Amongst the five renowned and experienced entrepreneurs gracingthe event were veterans Mr Kenny Yap from Qian Hu Corporation and Mr Derek Goh from Serial System Ltd, who alongside Ms Phua Huijia, shared their entrepreneurial experiences in an engaging panel session. In a no-holds barred, politically incorrect fashion, Mr Yap addressed questions with frankness and sharp wit, eliciting laughs from the audience as he put across his own experience facing the challenges of being an entrepreneur. The more mellow Mr Goh also gave us insights into keeping an open mind about learning, and how a spirit of learning and teachability enables one without bombastic qualifications to succeed. F for fail - the one word that students (or anyone for that matter) dread the most. Huijia giving her keynote speech. Challenging educators and everyone else present in the audience with the notion that failure is a necessary step along the route to success, educators were encouraged by Huijia’s speech to perceive their students’ failures as not so much as just an outcome but proof that they are actually trying; and trying to be more than who they were before. In the cut-throat business world, failures are aplenty. Yet every instance of failure is a learning opportunity. One business strategy shared by Huijia was the Lean Startup methodology, which includes creating a Minimum Viable Product (MVP) that tests the demand for a product or service in the market as early as possible. As she accurately pointed out for aspiring entrepreneurs, the question entrepreneurs should ask is not “Can I build it?” but “Should I build it?”. In addition, one of our takeaways from the panel sharing was that we need to know when to accept failure and to cut our losses once we find out that something is not working instead of carrying on mindlessly, a sentiment that Mr Yap shared. For an entrepreneur, giving up on something one has worked on for a long time can be painful, but the learning experience could later be better applied to creating something better. We were so very impressed by the innovative and broad-minded culture that the leadership of Broadrick Secondary has created for its students! We could really tell that the students were empowered by the opportunity to share their efforts in innovation to external guests and students, and that their efforts appreciated by the larger community. It is heartening to know that Broadrick embraces applied learning and real-world experiences as much as we do, and we were truly honored to be part of this inaugural event. We would like to thank Broadrick for inviting us to this event, which enriched us through the dialogue between the invited guests and educators, as well as the showcase of creative works done by students (who were younger than us!). Not to forget, a huge kudos to the organizing committee of the conference, they did an amazing job and we feel that this is an enterprising effort in itself and that the team deserves to be congratulated for their efforts! Congratulations once again for the successful organization of this conference, and we look forward to next year’s bigger and even better event!